On this date in 1858, youthful delinquent James Rodgers was hanged in New York City. Corner-loungers evidently share behavioral DNA with the common high school meathead, for Rodgers (drunk on rum) precipitated his trouble by carrying “his arms a-kimbo, so that one elbow hit [John] Swanston violently as he went by him.” Swanston, a respectable burgher returning from market with his wife, didn’t take kindly to this territory-marking, and exchanged words with Rodgers until the punk terminated the conversation by planting a knife between Swanston’s ribs. The unfortunate gentleman, perhaps second-guessing his decision to make such a big deal over the elbow, expired painfully in the street as witnesses rushed to the scene. If the Herald is to be believed, a concerted clemency push (including author Caroline Kirkland, who called personally on Gov. John King) went begging owing to a general public outcry against corner-lounging Irish hoodlums and their a-kimbo elbows. Even though Rodgers was hanged in private in the Tombs, New Yorkers strained the roofs of nearby buildings (at ten to fifty cents per head) just to get a glimpse of him being walked to the gallows with the rope picturesquely around his neck and whatever else they could peep over the walls. Reportedly contrite (he slept on the stone floor of his cell and ate bread and water by way of self-mortification), prayerful, handsome, and at the gallows unflinching, the youthful Rodgers died game … and also harrowingly. The Tombs was already by this point employing a gallows that jerked the condemned upward rather than dropping him through a trap: the idea was that this method would humanely kill the wretch on the first strike of the knot. That was not the case for James Rodgers. By the time the executioners axed through the rope restraining the counterbalance and the fall of a 250-pound lead weight yanked Rodgers into the air, the noose’s knot had slipped to the nape of the culprit’s neck where it would fail to deliver a lethal fracture. The killer twisted and fought horribly for some eight minutes as he strangled to death, even freeing his right hand from its restraint and with it tearing at his heart. “Sickening to behold,” reported the New York Times. 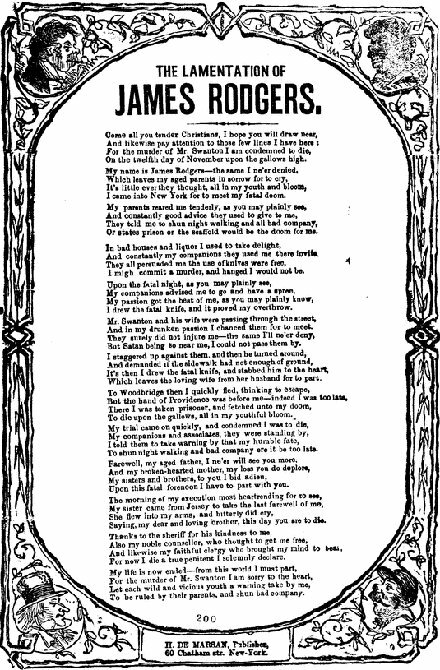 This ditty appears to have been appropriated, meter and lyrics alike, a generation later for the ballad “Charles Guiteau” — whose subject is the nutter assassin of President James Garfield. Guiteau hanged in 1882. It’s pretty striking, really, even if not unusual for the genre; the lyrics show a line-for-line lift. To these few lines from me. To sorrow and to die. To meet my fatal doom. Here’s the Garfield version … as the guilt-ridden young tough James Rodgers is not much remembered on YouTube.